…whatever will be will be and what’s done is done. But aaah! Serra! I loved walking through those monumental, warm folds of steel. I so wanted to run my hand across the surface and pull a henna-colored, granule film of rust onto my hand. The steel looked so warm from its rusty patina it looked more like teak or Phillipine mahogany than the 2-inch fold of solid steel. I felt like I was swimming in a Rothko painting. What blunts this experience, however, is transcendence has a ceiling : ( -Much like seeing the majestic Orca at Seaworld whose fin is weakened for want of swimming the great distances of the ocean, Serra’s sculpture is caged. It does not enfold you and shelter you against the stark contrast of the metropolis or the universe we marginally know through the lense of the sky – it, itself, is housed. 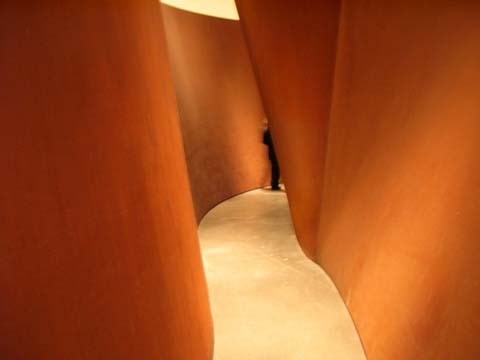 Both, however, still have entertainment value and, if given the choice, go see the Serra. As for entertainment value, John and I had a great evening. We headed for the reception tent first for some sangria and munchies. I was impressed. 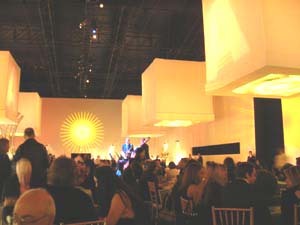 The space was beautifully lit with light that was scrimmed and projected and included an uplit runway, and a jazz combo played; altogether creating a space that was subdued, relaxed, still festive, but still allowed for conversation. We had an engaging chat with the couple we shared a table with. The subject of the Broad’s had him sharing what he knew about Hearst and J. P. Getty’s wealth. I hope I can find that movie he mentioned: The Cat’s Meow. From reception-event central we proceeded to the new building. Upon my approach it looked as though Piano (I love that name) internalized and projected all those Pompidou Centre-adjacent Tschumi follies onto this BCAM building. The stairs connecting the floors outside and the shock-scale freight elevator inside along with the expressed structure along the way added a Tschumi-folly zest to the stalwart, travertine-clad building. After the Serra experience on the ground floor we took the passenger elevator up to the 3rd floor entourage: Basquiat, Rauschenberg, Johns, Kelly, Schnabel, Twombly, Baldessari, Koons, Warhol. I was surprised Warhol’s Jackie Kennedy portrait grabbed me the most: a photo taken of her unaware and with an expression of quiet grief is repeated and gridded out onto a larger canvas. There is a Chinese philosophy that believes that all moments are eternal and our lives are a process of actualizing these moments. In repeating the moment of this photo, Warhol dissects its eternity frame by repeated frame. What’s even more striking is this “aura” is created by mechanical reproduction. The play of ink in each silk screened copy inflects the expression on her face and the quality of the print: sometimes vivid, sometimes blurred…somehow casts this eternity in slow motion. We ducked out to take the stairs down to the second floor and found a balcony that provided great views out into the city. The second floor wasn’t as much fun as what came before: “dog run” took up way too much real estate for its flimsy content and vague wit; however a lot of people, myself included, delighted in the big table and chairs installation. I couldn’t help but wonder if our sense of scale trumps our sense of smell for triggering memories. Overall, the building is a manageable scale and provides a clear sense of orientation for the visitor – which I like in a museum. Navigating a building and pacing your visit and gaging your procession can easily compete with and distract from the subject at hand (my first visit to the Metropolitan for example). The building’s galleries are phrased around a service core and opens up to views to the north and south. 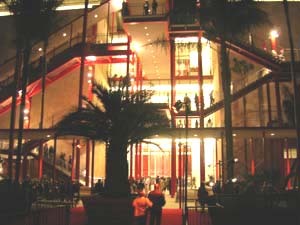 By night, that south view offers glimpses into the museum from Wilshire. I also liked the diffusers in the floor. Traipsing through the galleries, the softest updraft of fresh air prompts you out of museum fatique – which is a very modest effect with BCAM. We headed out for the coffee and cookie scene between buildings (BCAM/LACMA) (and now for something completely kitschy…) for a quick pick-me-up and then hoofed it over to catch the last open moments of LACMA’s galleries. We scratched the surface of an exhibit on German Expressionists; a gallery, adjacent, which included some works from the Bauhaus, Otto Wagner, Loos; another gallery with Picassos and I caught a Stella with a side glance over my left shoulder into a distant gallery as we were ushered out. I’m definitely going back.